On Saturday, March 3rd, the Garden City Electronic Music Society presents the Electro-Acoustic Showcase, an exploration of electronics within the traditionally acoustic genres of folk music and jazz. This all-ages event will take place at the historic St. Anne’s Academy Auditorium at 835 Humboldt Street in Victoria BC, from 7pm to 10pm (doors open 6:30pm). 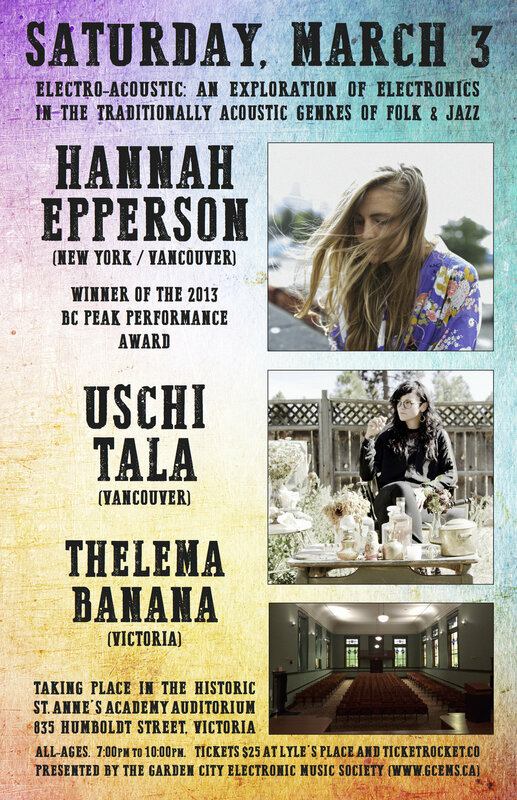 Headlining this event is Hannah Epperson, who will have just released her second full-length album, "Slowdown", in February 2018. Armed with her violin, loop pedal and voice, Hannah is a sonic weaver who arranges musical landscapes without indulgence or over-saturation. Hannah’s career has been on the ascendancy since receiving the BC Peak Performance Award in 2013. She has since relocated to New York, and will have just completed a European tour before coming to Victoria. Hannah’s breadth as a collaborative and compositional powerhouse stems from from an eclectic experiential and educational background: from learning Appalachian folk tunes by ear with a cowgirl in Utah to travelling through Scandinavia and Europe as an accompanist; or from touring her solo project by sailboat with permaculturists to accompanying Flamenco dancers in Spain. Her sound crosses genres and she has gained international recognition as a powerful songwriter whose compositions weave classical emotion together with the raw energy of indie music. A self taught multi-instrumentalist and poet, Vancouver’s Uschi Tala draws inspiration from the elementsw, the underworld, and the light found within darkness. 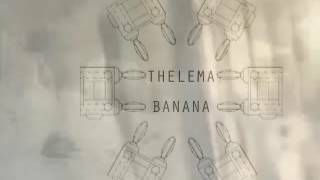 Wielding a loop pedal, beat machine and various instruments, she creates ambient soundscapes that dance along hauntingly serene vocals and rhythmic rhymes. Uschi’s music has been described as tragically beautiful, distinctively unique, otherwordly and pure magic. Her lyrics embody an ocean of healing and encourage others to sea the radiance in themselves as well as the bigger picture. She will ground your spirit, and raise your heart into etherial worlds of the in between. 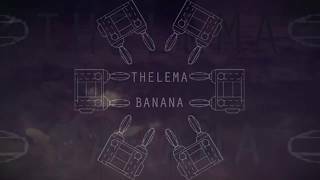 Victoria’s Thelema Banana are an experimental jazz trio featuring percussion, bass clarinet, accordion, musical saw and electronics. The acoustic instrumentations are creatively processed through effects while triggering synthesizers and other electronic instruments. 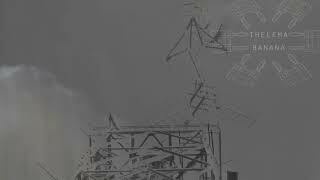 The end result has been characterized as post-industrial ambient married with a kind of xenophrenic jazz and soul. Video art will accompany each artist. Tickets are $25 and can be purchased at Lyle’s Place (770 Yates Street, Victoria) or through ticketrocket.co. The Garden City Electronic Music Society is a non-profit arts society dedicated to the advancement of electronic music, related media arts and the technologies used within these art forms. The mission of GCEMS is to explore creativity and innovation at the intersections of art and technology.